I have been coming to Sturgis since 1986, and have attended numerous times. The last time I came was in 2006 and I told myself I would not return. Circumstances changed and I found myself meeting Tanya here. Every other time I arrived at the beginning of the rally. This year I came towards the end. Smart move. I met a lot of nice people on this journey, from Wes and Dave of F.I.W.S. to the Anderson’s of Wisconsin, who gave us the idea of staying an additional day. My photo of the day for day 227 is of a couple we met in Spearfish, SD today. He was from IN and now lives about 30 miles from me. It is a small world. For those of you that I gave my card to that are here for the pics of the events, I am beginning my ride home tomorrow, and I will get them all up after I get home. Hope you had a safe ride home. Last May, I came through South Dakota and Sturgis with Tanya, and all I could do was talk about how much more fun it would be if we were on a bike, riding down these open roads. Today, we lived the experience. She drove from IN to meet me, and today we went into Sturgis and cruised Main Street. 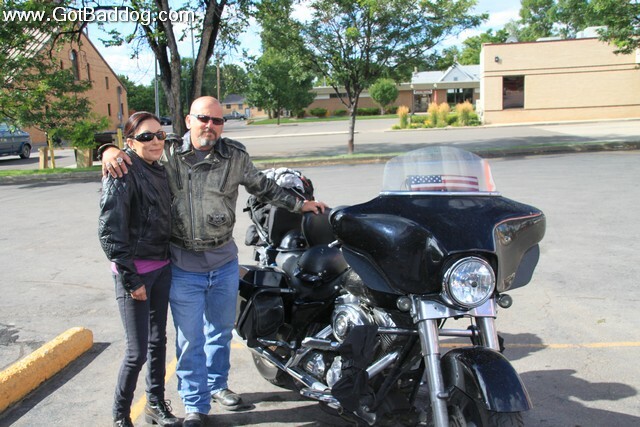 We then rode to Rapid City to hit the Harley dealer as I had gotten a short that caused my tail light to not come on. I suspect it was from this huge bump I hit somewhere in CO. It was so severe, I was sure something broke. Guess I was right. 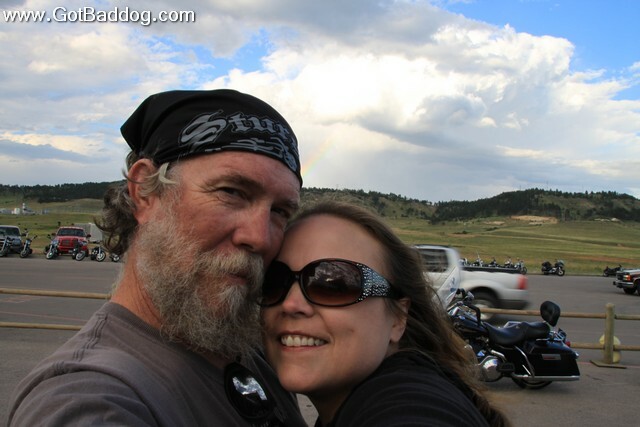 My photo of the day for day 225 is of Tanya and I in Rapid City with a rainbow in the background. It looks like she is having fun. I learned about Psycho Donuts, in Campbell, CA via their Facebook page. A quick look at their specialty donuts convinced me that I needed to take a drive up there and sample their goods. This past weekend Tanya, Buddy and I made the journey. We had a good time and met some nice people along the way.